Robotic technology is transforming current practices in industries such as mining and manufacturing. Following this trend and current R&D activities worldwide, it is envisaged that this technology will also soon have a significant impact in agricultural practices. Robots can be used for tasks related to field and crop management enabling new management practices and data collection leading to further advances in PA. Like internet and mobile phone technologies a decade ago it is hard to envisage the full potential of having this technology deployed can bring. We cannot but imagine a potentially significant economical, environmental, and social impact. With a world population currently over 7 billion and projections of almost 9 billion by 2050 , sustainability and food security worldwide are facing significant challenges. In order to accommodate this demand, it is predicted that food sources may have to more than double capacity given our current food consumption habits and supply chain practices. Changes in diet in developing economies, constraints on land allocated to agriculture, high cost water and energy, plus environmental concerns and climate change are some of the key challenging factors. Australia, in particular, faces a real challenge to ensure its participation in food production is both competitive and sustainable. With the development of very competitive markets, Australia can no longer be the supplier of the lowest-cost agricultural commodities. There is also an increasingly reduced availability of land water. About 3/4 of growers cannot sustain current operations, and there is an ageing workforce with a low replenishment rate. The low number of students taking interest in agricultural studies is also of concern. To address these issues, there is a need for an increased quality of produce and exploitation of premium and niche markets; an increased robustness of crops to deal with climate variability; the development and adoption of new technologies; the development and adoption of policies leading to sustainable practices; and an increase in investment in R&D and education in agriculture. This article looks into the future of agricultural robotic systems as a tool that could enable a transformation of practices and the adoption of new technologies in field and crop management. This could lead to a significant economical, environmental, and social impact. It also discusses the enabling factors and barriers for the uptake of this technology. Robotics is transforming current practices in industries such as mining and manufacturing. Following this trend and current R&D activities worldwide, it is envisaged that this technology will soon also have a significant impact in agricultural practices. Through the industrial revolution, agricultural practices were transformed by the use of machinery that multiplied the human mechanical power used to conduct operations in field and crop management. This led to an increase in the size of fields and machinery as we see them used by growers today. The green revolution with advances in biotechnology and agrochemicals lead to an outstanding increase in yield over the past 30 years. With the increase in the size of the fields, knowledge about crop, soil and weed population has also gone from begin site specific to field average - space wise as well as time wise. In the 1980s, precision agriculture (PA) emerged as a technology-enabled management concept to increase long-term productivity, profitability and sustainability . Advances in global navigation satellite system (GNSS) technology and control systems have enabled the use of controlled traffic farming (CTF) to confine heavy machinery to the least possible area of permanent traffic lanes, which reduces soil compaction and minimises the use of inputs by reducing application overlap. Figure 1. Concept of AgBot - agricultural robot - being developed at the Queensland University of Technology. The use of remote sensing based on satellite and aircraft imagery has led to site-specific crop and weed management (SSCWM) strategies in terms of variable rate technology (VRT) and decision support systems, which in addition make use of yield data from sensors fitted to harvesters . As mentioned in the previous section, robotic technology has transformed the manufacturing industry and is currently rapidly finding its way into mining. The evolving use of robots and intelligent machines is described as the second industrial revolution. Following these trends, it is believed that the use of multiple cooperative highly-autonomous farm vehicles could lead to the next step in agricultural automation. The AgBot is 2m long by 3m wide (this can be adjusted), and 1.4 m height. 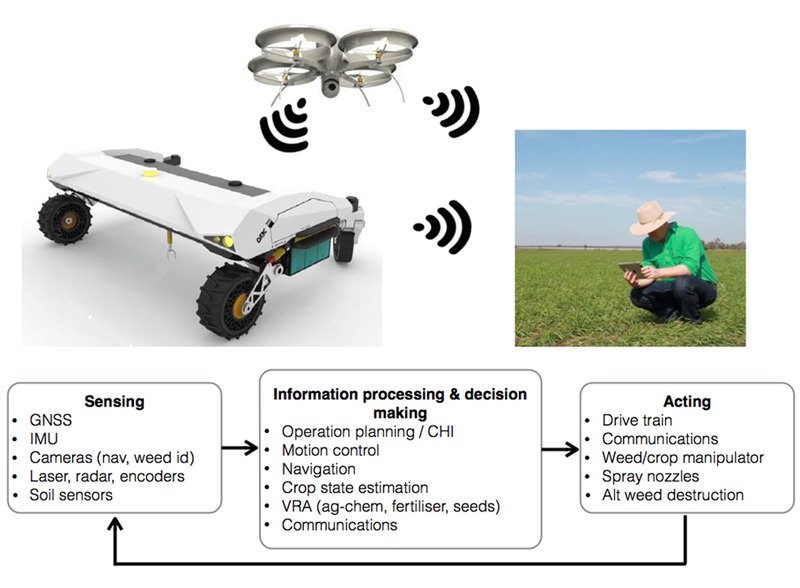 Such platform can operate cooperatively and autonomously in a swarm concept in applications of weed management, fertilising, and seeding. The robots may also have the capability to communicate with unmanned aircraft and the operation manager to combine different kinds of environment and field information. The robots are equipped with sensors for navigation: GNSS receiver, inertial measurement units (IMU) (which measure accelerations and rate of turn), cameras, and encoders. Sophisticated algorithms for data-fusion are used to extract information from the variety of sensors. This also allows the use of cheap sensors to obtain high accuracy in robot localisation and navigation. For example, in recent experiments, the combination of a low resolution web-camera information was used to track heading angle and robot cross track by processing image information of crop rows combined with a low cost IMU (Au$200), which lead to an accuracy of 10% of the inter-row spacing in cross-track error without the use of GNSS . These results can be aided with a cheap GNSS receiver (Au$200) to increase robustness to visual characteristics of crop rows . The same cameras used for navigation can also be used to conduct image processing for detection and avoidance of obstacles during both day and night operations . This may potentially result in the suppression of expensive radar and laser ranger sensors as computer-vision-based detect and avoid technology improves in the future. The use of dedicated cameras for weed detection and classification can be used to control variable rate technology (VRT) in herbicide application. The weed-classification information together with the location of the different weed species through GNSS can be used for improving site-specific weed management strategies as well as studying weed population dynamics and weed-crop interactions . The swarm operation results in the vehicles operating at lower speeds of 5 to 10km/h. This may also enable the use of novel alternative weed destruction methods based, for example, on mechanical methods, microwave technology, thermal and solarisation [7,8,9]. Research on these technologies, which at some point in past was abandoned due to the cheap and efficient use of agrochemicals, is currently on the rise due to the increasing resistance that some weeds present to herbicides. Robots moving at lower speeds and with the ability to use vision for destruction and manipulation of weeds is opening new opportunities to alternative weed destruction methods. To date, we are at a stage where we have almost reached the limits of the size of machinery that can be used on the fields. Large heavy tractors and sprayers may require auto-steering for CTF to minimise areas of soil compaction. This type of machinery can sometimes be a single point of failure of certain operations - for example a fault in a sprayer could result in a delay in weeding operations and limit the advantages of crop lead-time growing (over that of weeds). The use of multiple lighter robots is an alternative that can help in reducing soil compaction, and the failure of one robot does not halt the whole operation. Also, the ability of a robot to self-diagnose various failure modes and communicate these with the operation manager can lead to faster down-time recovery. Having robot platforms operating in the field can also be used to collect data for PA. This can enable a more refined site-specific crop management and estimates of yield before harvest. Sensor data for soil moisture and nutrient content as well as image data of crop health can be combined with weather forecasts to improve in-season decision support about crop management. When it comes to technology, a lot of progress has been done in terms of proof of concepts. There are, however, aspects still in need of further research such as energy efficiency, robustness of the autonomous decision making by the robots, increased reliability for long endurance operations, development of energy take points on remote locations, development of better robot-human interfaces. Operation of agricultural robotic systems will potentially have to be regulated to ensure safety. In order to this, there is a need to develop a framework for assessment of autonomy, regulations and procedures for certification. Some of these frameworks have already been proposed for unmanned aircraft, as in , and can be adapted to agricultural robots. This will also have a bearing on insurance premiums. In terms of business, there is a need to reduce the cost of equipment without sacrificing performance and safety. This is very much linked with the development and uptake of technology. The use of cheap sensors, for example, is enabled by sophisticated software and algorithms for data fusion and estimation. As in any other areas, the adoption of the technology will lead to a reduction in equipment costs. Since there are currently no robots conducting long operations, there is little data available for estimating reliability relative to other equipment. Agricultural robotic systems, however, fit in with VRT and CTF. Therefore, we could expect similar gains in terms of better management of inputs such as fuel, fertiliser and chemicals, which account for 16% of farm costs , plus further improvements in reduced fuel and energy consumption. However, at this stage we are working on estimates of return benefits expressed in terms of Au$/ha. Also, it may be possible to have a roll-out of technology as a mix of farmer use and service industry and then transition more onto farmer operations only. These scenarios will lead to different economic benefits. There are aspects to be considered in terms of legal issues such as, for example, liability in the application of herbicides and the potential damage to the environment. Socio-economical aspects are of great importance for the uptake of this technology. Questions as to wether this technology can attract a younger generation to agricultural industry, the benefits to the economy in the creation of the agricultural robotics industry, the potential development of decision support systems and site-specific crop and weed management policies associates with PA are but a few of the socio-economical aspects that need to be understood better. Although the article has focussed on insights into grain production, some of the potential benefits discussed also extend to horticulture. Specific to this industry, however, there are benefits that could be brought by automated harvesting. Today, most of the harvesting of horticultural produce is done by human labour. This creates some challenges for growers. There is stress in finding a capable sessional workforce to take of advantage of the optimal time-windows for harvesting. Often times, there is a significant produce loss due to re-growth, which is not financially viable to harvest with a human workforce - this can be addressed with robots. The benefits for using agricultural robots designed not only for weed management but also for harvesting can be significant . United Nations (2004) “WORLD POPULATION TO 2300” UN Department of Economic and Social Affairs - Population Division. Report ST/ESA/SER.A/236. B. Whelan and J. Taylor (2013) Precision Agriculture for Grain Production Systems. CSIRO Publishing. A. English, P. Ross, D. Ball, P. Corke (2014) “Vision Based Guidance for Robot Navigation in Agriculture”, in Proceedings of IEEE International Conference on Robotics and Automation (ICRA), May 31 - June 7, Hong Kong, China. A. English, D. Ball, P. Ross, B. Upcroft, G. Wyeth, P. Corke (2013) “Low Cost Localisation for Agricultural Robotics”, Australasian Conference on Robotics and Automation (ACRA). 2-4 December, Sydney Australia. P. Ross, A. English, D. Ball, B. Upcroft, G. Wyeth, P. Corke (2014) “Novelty-based Visual Obstacle Detection in Agriculture”, in Proceedings of IEEE International Conference on Robotics and Automation (ICRA), May 31 - June 7, Hong Kong, China. B.D. Maxwell and J.T. O’Donovan (2007) “Understanding Weed-crop Interaction to manage weed problems” Chapter 2 in Non-chemical Weed Management - Principles, Concepts and Technology by M. K. Upadhyaya and R. E. Blackshaw (Eds.) CAB International. D.C. Cloutier, R.Y. van der Weide, A. Peruzzi and M.L. Leblanc (2007) “Mechanical Weed Management” Chapter 8 in Non-chemical Weed Management - Principles, Concepts and Technology by M. K. Upadhyaya and R. E. Blackshaw (Eds.) CAB International. J. Ascard, P.E. Hatcher, B. Melander and M.K. Upadhyaya (2007) “Thermal Weed Control” Chapter 10 in Non-chemical Weed Management - Principles, Concepts and Technology by M. K. Upadhyaya and R. E. Blackshaw (Eds.) CAB International. O. Cohen and B. Rubin (2007) “Soil Solarisation and Weed Management” Chapter 11 in Non-chemical Weed Management - Principles, Concepts and Technology by M. K. Upadhyaya and R. E. Blackshaw (Eds.) CAB International. T. Perez (2013) “Robust Autonomy of Intelligent Autonomous Vehicles.” Keynote address, at IFAC conference on Intelligent Autonomous Vehicles, 26-28 June, Gold Coast, Australia. R. Rankin (2010) “Mechanisation, Automation, Robotics and Remote Sensing (MARRS) for Australian horticulture - Final Report” Horticulture Australia Ltd, Project HG09044.